To get your HP EVA storage system and VMware ESX hosts storage balances you get a better performance. Here are some Best practices. The VMware vSphere and the HP EVA 4×00, 6×00 and 8×00 series are ALUA compliant. 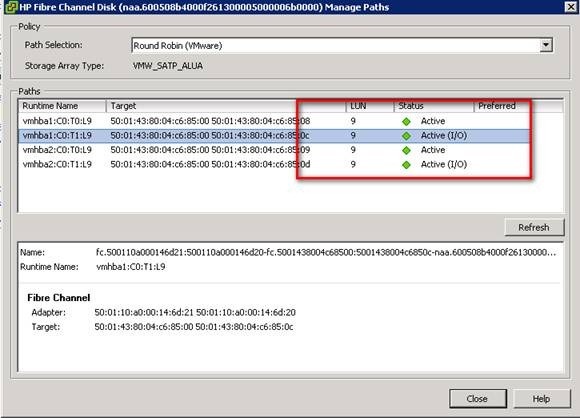 ALUA compliant means in simple words that it is not needed to manually identify preferred I/O paths between VMware ESX hosts and the storage controllers. On controller failback (previous owning controller returns), the units remain on the surviving controller. No failback occurs unless explicitly triggered. 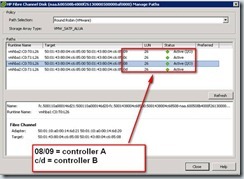 – On controller failback, the units are brought online on controller A implicitly. – On controller failback, the units are brought online on controller B implicitly. 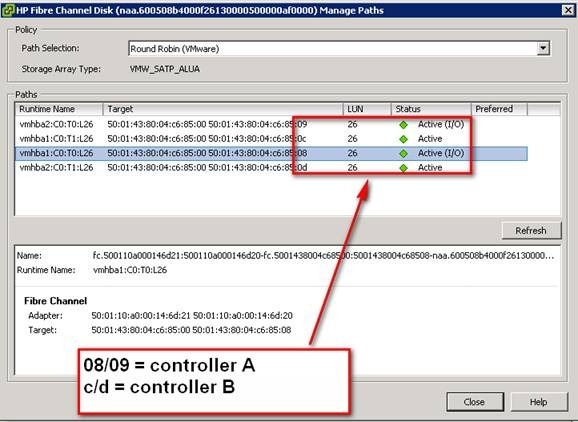 On the HP EVA half of the Vdisks are set on path A-Failover/failback and the other half of the Vdisks are set to B-Failover/failback, so that they alternate between controller A and B. This can be done from the HP EVA command view. 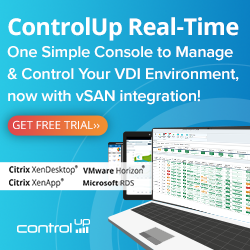 Now the vDisk are distributed between the two controllers we can go to the vSphere configuration. On every vSphere host perform an rescan or reboot. The fixed multi-path policy is not ALUA compliant and therefore not recommend to use. – Native Multi-pathing Plugin (NMP), handles the multi-pathing configuration, communicates with the SATP and PSP to indentify path failure conditions. – Storage Array Type Plugin (SATP), handles specific operations such as device discovery, error codes and failover. 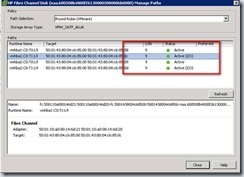 – Path Selection Plugin (PSP), handles the best available path, there are three policies fixed, MRU and Round Robin. To solve this IOPS bug, edit the /etc/rc.local file on every VMware ESX host and and add the IOPS=1 command. The rc.local file execute after all init scripts are executed. After adding the IOPS=1 command restart the VMware ESX host and check the IOPS values when its back online. Now you can check if the the Round Robin policy is active and the LUNs are spread over the two controllers. Here are some great PowerCLI one-liners created by Luc Dekens. Thanks for creating so quickly these one-liners for me! Just wonder where you found the best practice to change the IOPS to 1? As I’ve never seen such a recommendation before. I already found. Something I would like to test is how it effects performance or overhead. I hardly believe that setting path IO limit to 1 is best practice, actually I would strongly advise against that. Now, the reason for the IOPS=1 recommendation is because during lab tests that setting showed a nice even distribution of IOs through all EVA ports used. If you experiment with this you can see the queue depth for all EVA ports used very much even and also throughput through the various ports. Additionally with the workloads with experimented with, we noticed better overall performance with this setting. This is why we recommended it as a starting point for EVA configurations. As we know, best practices are not a one recommendation fits all cases. So we also recommend that end customers experiment when possible with various settings and tune their environment accordingly. But as a starting point IOPS=1 showed to be adequate for many workloads types. would it be possible to do “esxcli nmp satp setdefaultpsp –satp VMW_SATP_ALUA –psp VMW_PSP_RR” in PowerrrCli? Loosing the IOPS=1 setting still happens today with ESX4.0.0 build 236512 (latest). Is there a commmand I can run to determine the IOPS set for a single LUN (device)? I’m new to PowerCli and scripting al together, so I might be doing a rooke mistake here. We had an issue where the ESXi hosts were throwing “Unknow device naa.600” errors, even though the LUNs were fine, and the VMs on them working working. Doing this stopped the errors. Can some body explain why the best practise has caused this issue? We just had vmware tell us that they don’t recommend round robin on vSphere with EVA8000. Anyone have any problems with their round robin setup on an EVA? It looks like PowerCLI script to set the multipath policy to round robin will also affect local drives on the host. Is this correct? And if so, will this affect anything since there is just one path to those drives anyway? No issues reported before had seen issues with fixed paths and the 8000 series that was leading to LUN drops at random points. Can this both be RR as MRU ? This is what I used for ESXi 4.1 update1 attached to EVA4400 and P2000. Rebooted server after the first command. Some interesting information… is it still best practice? The command from the HP whitepaper is totally in the woods. We where told the following to make it stick. NOTE: Setting the IOPS with a value of 1 does not persist across reboots. Upon reboot the value will jump to the default of 1000. The following command is recommended to make the setting permanent. After i did what you wrote, my ESXi 4.1 went in total lockdown. Cant even re-image it anymore either. Still checking what just happened… but this was the only change that was made. FYI. ESXi5 finally retains the IO limit setting ! ESXi5 script to apply PSP default Roundrobin for SATP ALUA, update any assigned LUNS to Roundrobin and change IOPS to 1.